Anyone who knows me is well aware of my disdain for predictions. Nobody has a crystal ball and even if you think you have one, as economist Edgar R. Fielder once said, “He who lives by the crystal ball soon learns to eat ground glass”. I prefer to think in terms of probabilities. However, predictions are just so much darn fun. Quite frankly, given the laser-like focus on cost this year, I’m shocked we didn’t see an ETF provider make a splash with a zero cost ETF. Much has been made about the “race to zero”, but a free ETF has yet to materialize (though some ETFs are effectively free or can actually pay you to own them when adding in securities lending revenue and/or positive tracking error). The closest we came to a free ETF in 2017 was StateStreet’s SPDR Portfolio Total Stock Market ETF (SPTM) and SPDR Portfolio Large Cap ETF (SPLG), both launching with miniscule 0.03% expense ratios (or $3 for every $10,000 you invest) as part of a new suite of 15 SPDR ETFs. Maybe we’ll see zero in 2018. 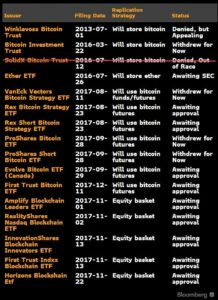 Bitcoin will continue developing into one of the more fascinating market stories we have ever witnessed and ETFs will be along for the ride. 1) Bond ETF innovation moves to the forefront, particularly in the so-called “smart beta” category. I have long believed the fixed income ETF space was ripe for innovation. With concerns growing over rising rates, inflation, and a frothy credit market, I think this will be the year more investors search for precise fixed income solutions and ETF providers will deliver. Expect a bevy of new ETFs focused on interest rate hedging, inflation protection, yield optimization, and factor-based approaches such as screening bonds for credit quality and momentum. Existing ETFs in these areas (of which there are already some good ones) will continue gathering assets. 2) Non-transparent ETFs fail to gain traction. Actively managed, non-transparent ETF structures, such as the one Percidian is currently seeking approval on from the SEC, have received quite a bit of attention. These structures would allow fund managers to avoid daily disclosure of their holdings, something standard ETFs require. Fund managers are fearful of giving away their “secret sauce” and seeing their trades front-run. I have three issues with this: 1) Based on conversations I have had with fund managers, I believe fears of front-running are overblown, 2) Most active mutual fund managers, where holdings are disclosed quarterly, consistently underperform their benchmarks (i.e. there’s no sauce to keep secret), and 3) Investors want greater transparency and simplicity, not less (try explaining how non-transparent ETFs work to Grandma). I’ll be surprised if non-transparent ETFs catch on. 3) Cannabis ETFs begin to rake in assets, though keep an eye on capacity issues. With several states likely to legalize marijuana in 2018 and California becoming the eighth state to legalize recreational marijuana on January 1st, there is no question we are in the very early days of a movement towards broader pot legalization and a potentially enormous growth industry. The recently launched AdvisorShares Vice ETF (ACT) offers approximately 20% exposure to cannabis-related companies and the ETFMG Alternative Harvest ETF (MJX), which debuted earlier this week, “tracks companies likely to benefit from the increasing global acceptance of various uses of the cannabis plant.” Expect more ETF launches around this burgeoning industry and strong investor interest. However, keep an eye on potential capacity issues (think GDXJ) given the limited number and size of companies in this space, not to mention an uncertain regulatory environment. 4) Socially responsible ETFs continue to garner more media attention than assets. Look, there is no question a growing number of investors (especially millennials) want and expect companies to do the right thing, whether environmentally, socially, or as it relates to corporate governance. However, in talking to clients, the challenge I hear is that very few companies are going to check every box. Perhaps Coca-Cola has an excellent track record with gender diversity, but maybe you disagree with them pushing sugary drinks to kids given society’s problems with obesity and other health issues. This is admittedly a crude example, but the point here is there is no one-size-fits-all approach. Investors have different beliefs and convictions. It is simply impossible to capture all of those unique beliefs in a single ETF. Sure, an ETF like the iShares MSCI KLD 400 Social ETF (DSI) is moving the needle in a positive direction, but my sense is investors are skeptical of just how much. I believe good, old fashioned social pressure will enact more corporate change than investor dollars. Inclusionary or exclusionary screens are fine, but there is no one size fits all – investors care about different ESG factors. Think model for success might be championing very specific causes such as @ImpactETFs attempting to do. 5) ETF education goes mainstream. While the first ETF, the SPDR S&P 500 ETF (SPY), turns 25 years old in January, I believe we are still in the early days of ETFs. The majority of people I talk to still either haven’t heard of ETFs or aren’t quite sure what they are (EFTs anyone?). I think that begins to change in a meaningful way in 2018. Just in the past several months, Bloomberg launched the first ETF-focused TV show, ETF IQ, along with a new ETF podcast, Trillions. More ETF providers are ramping-up education efforts and independent research firms like ETF.com are aggressively getting the word out. 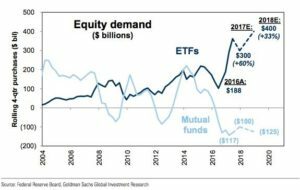 With the growing number of ETFs and shops like Goldman Sachs projecting equity ETFs to grow even faster in 2018, education is more important than ever and the industry will respond.